White Plains student Raina at the 24 hour encampment. Photo courtesy of Andrew Courtney. WESPAC members have delivered petitions with hundreds of signatures to Senators Schumer and Gillibrand and Congress members Lowey and Engels asking them to vote NO to authorization of US military strikes against Syria. This position reflects a broad consensus among constituents. Westchester Residents Petition Congressional Reps: No War on Syria! White Plains, NY. Following a 24-hour encampment in downtown White Plains to protest Obama administration plans to bomb Syria, concerned Westchester citizens will gather Monday afternoon to march to Rep. Nita Lowey’s office to present a petition calling on Congress to vote against the proposed attack. On Friday, September 6, protesters set up an encampment at the Plaza Fountain, Main Street and Mamaroneck Avenue in White Plains. The group included clergy, labor union members, students from area high schools and colleges, retired military personnel and activists from the full political spectrum from left wing Democrats and Green Party members to Tea Party supporters. The planned Monday march—starting at 5pm at the Fountain–will present signatures gathered from passers-by at the encampment to Representative Nita Lowey before returning to the Fountain for adjournment by 6pm. 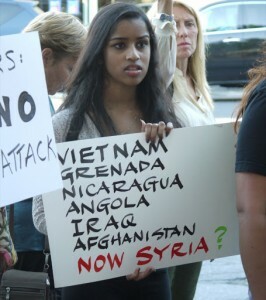 ‹ Syria: Not in Our Son’s Name!